Your bestie just announced she's expecting and you're ecstatic! You immediately start trying to think of a way to celebrate. It's never too early to start spoiling her--and let's face it, the first trimester can be less than glamorous. Today I'm sharing some of my favorite go-to gifts for the momma-to-be's in your life. A few funny, a few practical, and a few just plain awesome gifts to celebrate this exciting time! If you're looking for a gift that your mom-to-be will enjoy throughout her pregnancy, Belly Buds are sure to be a hit. These specialized speakers can be placed on her belly and play music directly to the womb. BellyBuds are a fun way for the mom to connect with her baby. By 30 weeks, studies have shown babies can begin to form memories, so that favorite song you're little one listens to in the womb, may be soothing to hear after birth. Morning sickness can be rough for some mommas during the first months of pregnancy. What better way to help her deal with this than boutique pregnancy barf bags? The cute pink pregnant lady graphic on the front has to make it slightly less painful to toss your cookies, right? They also come in a handful of other bright colors. A cute tee goes a long way in those early days of motherhood where you may or may not have time to shower. This Baby Mama tee is super soft and looks great with jeans (or sweats). It's never too early to embrace your new role. Mama Essence's line of organic herbal teas are designed for pregnant and nursing moms and are an easy way to help comfort mom-to-be. The Ripe Rasp-Baby blend is great for a mom at the end of her pregnancy to help prep her uterine muscles. The Tummy Tamer tea is great for the first trimester to help combat nausea. And if she's groggy and exhausted, the Slumber Par-Tea is the perfect blend to put a little pep in her step. Baby Teva's perineal prep oil is a holistic blend of oils to help mama strengthen and prepare her perineum for birth. Pickles and ice cream are synonymous with pregnancy. This pickle scented candle can be perfectly paired with a pint of Ben & Jerry's for your pregnant friends. Whether she's craving pickles or not, this candle is the perfect way to celebrate. 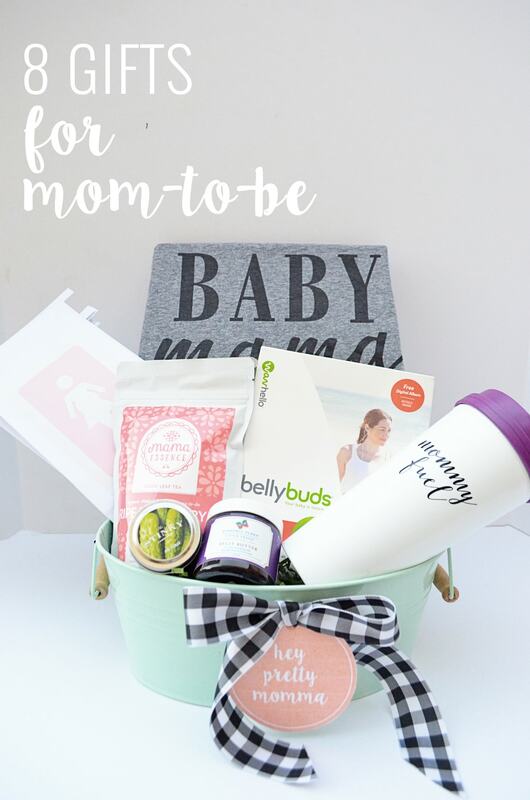 Pregnancy can be tiring--this tumbler is sure to make the mom-to-be smile. Whether it's filled with water, tea, or a little decaf--it's perfect for her the mommy fuel of choice. And let's be honest, it's pretty darn cute too! Pregnant bellies can become itchy and dry with all of the stretching that goes on. Spoil your friend by gifting her a jar of Kimberly Parry Organics Belly Butter. This lotion is designed to help promote skin renewal and soothe itchy, growing skin. What is your favorite way to celebrate mom-to-be? 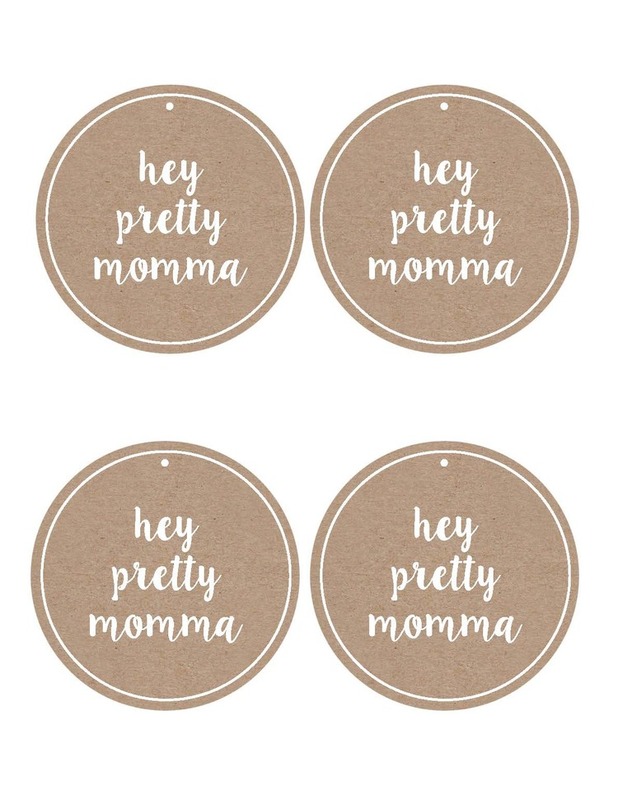 PS: I whipped up the little Hey Pretty Momma Tags for this post. You can print them here. Feel free to use these for your personal use to show your momma friends some love.